Retrace is a best-in-class, fully integrated, multi-environment APM+ tool for ASP.NET & Java Applications. Retrace is a simple to use SaaS application monitoring solution that aggregates APM, log, errors and metric data for consolidated motoring and insights in pre-prod and prod environments. Not sure where to start? Schedule a FREE live demo. Fill out the form below to set up a live demo. Of course, I immediately liked the interface and the ability to search logs was an awesome touch as well, but what hooked me was within 24 hours of installing Stackify we found an Exception that has existed since the launch of a new ad campaign we started 10 months ago. Most events/errors were trapped and reporting on this process because of its importance, but somehow this one thing wasn’t. The error existed for approximately 10 months and we were never aware of it; IE, the competitor’s product never barked about it. I immediately canceled my contract with the competitor and signed on with Stackify. 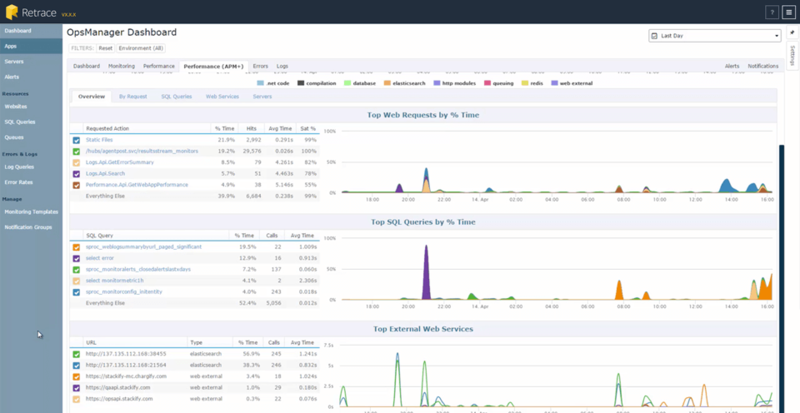 Until Stackify, there was no one tool to do monitoring, performance dashboards, log aggregation, and more. This same technology would come with 5 or more software/hardware products and 5 or more bills as well. Stackify does all of this in one package and provides you the actionable insights necessary to target problems when they happen and point you directly to where they are happening and all systems/software affected.